HomeFood & DrinkThe Cut: Bavarian nachos, new brew house and goat yoga! Not only did we reopen for the season on time, but we also survived our opening weekend! And if that sounds overly dramatic then you’ve never worked in a restaurant before! A lot happened while we were closed. We tore out and rebuilt our giant walk-in cooler, installed insulated paneling in the butchery, took everything out of the kitchen to redo the floors, installed a new computer system, and changed the menu. So much for a peaceful hiatus! Of course everything was completed at the very last moment. You could practically hear the dramatic music playing as service vans pulled in and out of the car park, technicians scrambling to finish projects as the hypothetical clock echoed the final ticks till countdown. When the time ran out, we looked around and cheered at our success – and then the smoker stopped working. The facepalm emoji was invented for moments like this! We limped through our first two days missing a few key items from our new menu, but Uli came to the rescue and the smoker was back in action! Liverwurst triumphantly returned to the menu and all was right with the world. The liverwurst is sharing menu space with some pretty awesome additions this year. 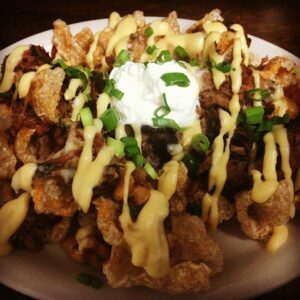 The Bavarian Nachos made a stellar debut and it’s quickly becoming a fan favorite. Homemade pork rinds topped with our pork BBQ, white beans, sour cream, scallions, and homemade red ale cheese sauce – what’s not to love!? Something else that’s causing us to swoon? Our new brew house! It’s been a puzzle and a challenge to assemble it, but it’s finally ready to brew! First thing on the schedule is OBX Kolsch. Even though we haven’t been able to brew for a month, we still managed to pull a few tricks out of our sleeve to start the season with a bang. 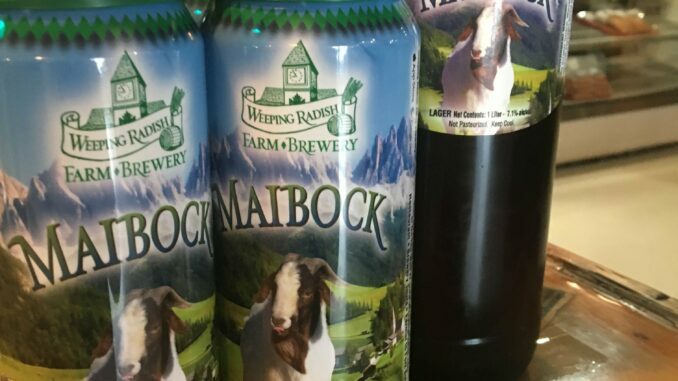 Our Maibock is on tap and in cans! With its rich sweetness perfectly tempered with crisp hops, this malty lager is a perfect start to spring. And it’s got a higher ABV to keep you warm on those chilly Spring evenings! We also debuted a Pilsner that is rapidly becoming a superstar. Pilsner malt and a combination of Hallertau Mittelfuch and Saphir hops make this beer as authentic as it gets. Currently available only on draft, we hope to can it later in the spring. There has been so much excitement already this month and March isn’t over yet! Taste of the Beach Weekend is coming up and we have events planned all weekend. Friday evening is our Pork Off! Mystery Meat Challenge at the restaurant (tickets are still available) and we will be serving beer at the Local’s Night in Nags Head. Saturday we’re serving beer at the BBQ Showdown and Sunday we have something extra special planned. Goat Yoga! Our friends at Freedom Farm in Chesapeake will be bringing their sweet baby goats to the Weeping Radish from 10-1 to help you burn off those weekend calories! The above column is sponsored content brought to you by the Weeping Radish Farm Brewery, www.weepignradish.com.